Increasingly many libraries, including the British Library, with whom we interact for inter-lending and document supply purposes are purchasing materials in electronic only formats, and in some cases this is the only format in which they are produced. For many this means that their licenses restrict the ability to loan or otherwise supply an item to another institution. This means for our customers that there are items that we are unable to supply. Thankfully for the most part this is only a small number of items but it is likely to grow. Here at Leicester we keep a list of licenses, maintained by our Copyright Administrator, that details what we can and cannot do – to the best of our knowledge – in terms of interlending or supply from electronic only items. For the most part this tends to be a “cannot be supplied” option, but this isn’t quite true across the board. Some publishers do enable the lending or supply of physical duplicates of electronically sourced materials. Thus when we do get requests for electronic materials to inter-lend we do our best to see if they can be on a case by case basis. How are other institutions and organisations handling this when you get requests for eonly items? Do you have a blanket “can’t loan/won’t loan” approach or do you check licenses in each and every case in the event that items are loanable under some circumstances? I think there’s scope here for a bit more research across the UK, and if there’s enough interest in my findings here I’d be happy to sort out a more structured survey! 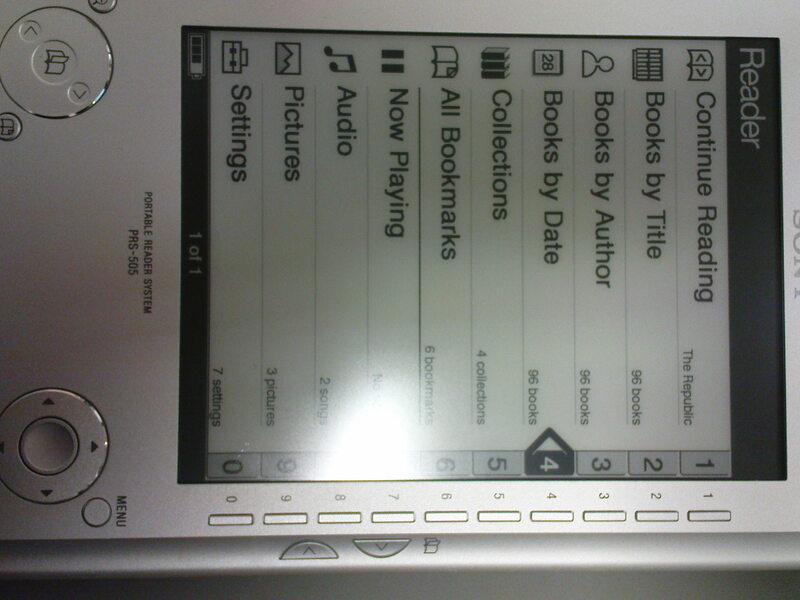 In preparation for the HRH visit tomorrow I was loaned the library’s portable ebook reader. As it turns out the turn I’m doing in the end won’t involve using it, but all the same I’ve had a couple of interesting weeks playing about with it. If you’ve not had a chance to get your hands on one of these (and considering Amazon lists them at £219 last time I checked that wouldn’t be a surprise) what is most striking right away is the screen. Designed to look more like a conventional page would to the eye without tiring it, which is something it does quite well. What is a slight niggle is that it displays text (monochrome only) even at the lowest magnification a little larger than I’d expect, which makes even short books pages more in length than their physical counterparts. Why does this matter? Well due to the biggest failing of the current model to my mind – the page turn. To turn a page is simply a matter of clicking the thumb buttons half way up the right hand side, which is quite a natural option. There’s also a dial button in the lower left that duplicates that function. However, when it turns a page the whole screen goes black and then the new page appears. It didn’t bother me much at first but as I read through The Importance of Being Ernest it got a greater and greater annoyance. It wasn’t giving me a headache, it just took far too long to flick to the next page of what is simply plain text. All that said I did read the book throughout quite easily at my desk, waiting for the train, sitting in bed. The feel of the reader and its leatherette case is quite comfortable weighing about the same as one of the more hefty paperbacks; considerably less than a hardback. I will mention that its metal case scores in terms of ruggedisation, but loses points for freezing your hands off on a cold train platform. A thin plastic veneer around the edges would go a long way to overcoming that problem. Or naturally a pair of gloves for the user. Oh and whilst I didn’t test it (this being a loaner) it naturally failed the bath test; or at least I don’t think I’d want to risk reading one of the 95 preloaded books in the tub. In terms of battery life it does better than quite a few other portable gadgets that I own (sat nav and PSP come to mind) in not just the longevity of the charge, but also how well it retains that charge when switched off. If I don’t use my TomTom for a week it’s as flat as pancake. 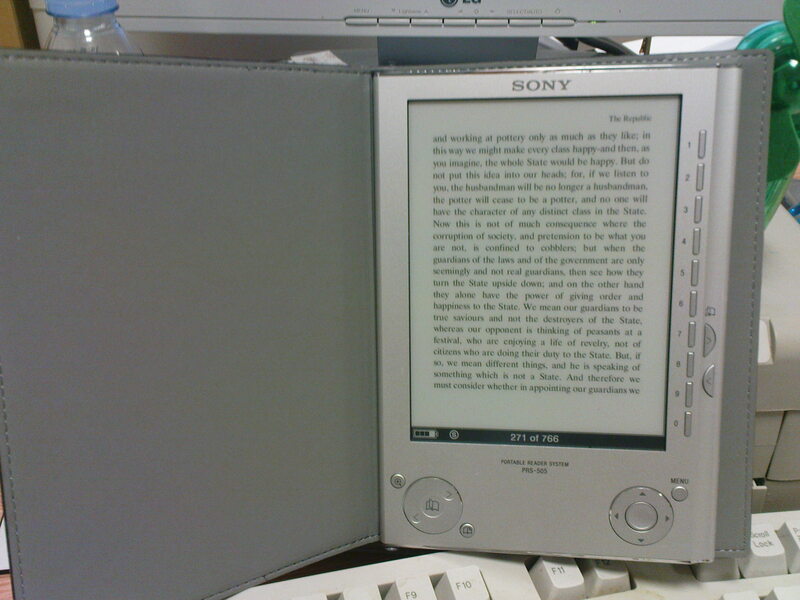 With not using the Ebook reader for a week, it had over 3/4 of its charge left. Vital for something that I might want to pick up and use at a moments notice. Recharging, and downloading new books, is via a USB 2.0 cable with a UC-E1 end (the sort your digital camera has most likely). I downloaded a book on marketing from one of the free ebook sites we recommend which worked fine as a simple file transfer. There is software that comes bundled to manage the ebook’s books, but from experience of mobile devices I’m happier using explorer to directly plonk items to the flash storage. One less piece of bloatware to clear off the home PC (and obviously couldn’t install on the work machine). Unfortunately none of our subscription ebooks I could find allowed download to portable readers, so I couldn’t test that out. Doubtless if I’d bought an ebook for myself I’d hope this would be just as painless a process. In terms of other ports there is 5.2v DC in (not included with the reader I had), a standard walkman headphone jack and volume control on the bottom. The top has twin slots for a PRODuo and SD cards as well as the sliding power switch. 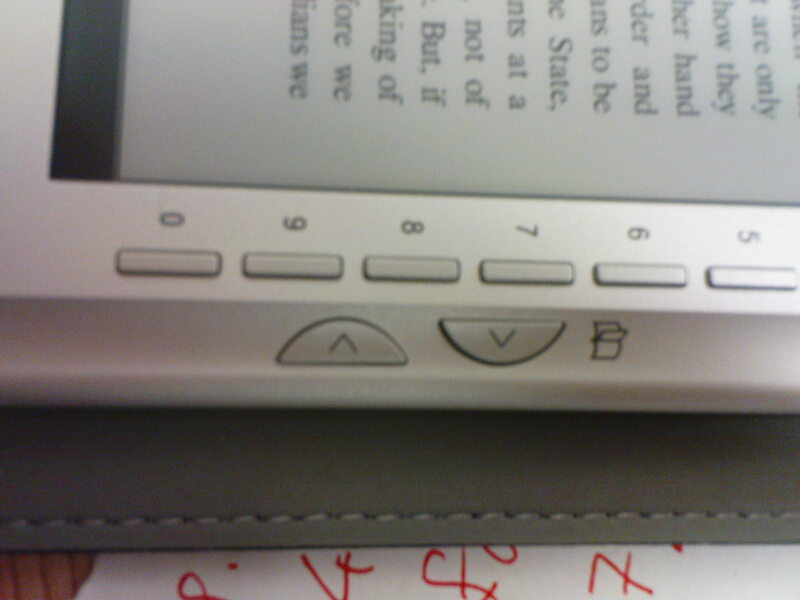 Other controls on the main body of the reader include a bookmark, zoom, menu, menu navigation D-pad and numerical buttons down the right hand side. Using these it is easily possible to navigate or jump to a specific page. I confess I wasn’t overly fond of the numerical buttons in terms of look and feel; they felt a bit clunky and out of place with the smooth lines of the rest of the device. But they worked, and function before form is something I can live with. So overall a useful little device, with some software flaws and hardware niggles, but it does the job. Would I buy one for myself? The answer is no – I’d like to wait a couple of years for the developers to get the page turning faster and less looking like an etch-a-sketch at times, a revision to the numerical buttons and perhaps a warmer to the touch feel than cold metal. And I’d like it for about £150 less and waterproofed thank you very much. Not such a tall order is it?